 » Senior Infants » You&apos;re currently reading "Ms Livingston’s Senior Infants"
Welcome to Ms. Livingston’s Senior infants. 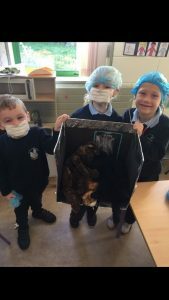 This month, our Aistear theme was The Vet. We learned all about how the Vet is very important in our community and what they do to help our pets. Each day we play at a different station which is based on our theme. We made our own bread. We measured how much of each ingredient we would need. We put it in the oven to bake. It tasted delicious! We even got to take home a slice for someone at home to try. 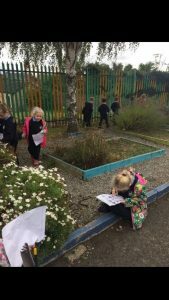 We went on an Autumn Nature walk around the school grounds. We used a checklist and clipboards to record what exactly we saw. Some of the items we collected were conkers, leaves and pinecones. We brought some of them back into our class to put on our nature table. 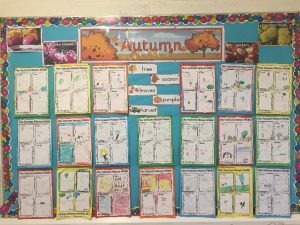 Then we wrote about what we saw, what we heard, what we smelled and how we felt when we were on out Autumn walk! 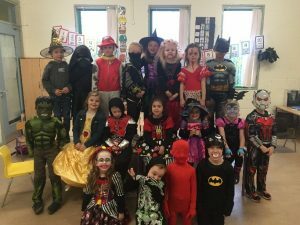 We also had a exciting last day before midterm, we dressed up in our Halloween costumes and bought lots of cakes in the cake sale! Ms Ryan’s Second Class	Mischief Managed in Ms. Kett’s Class!